The Institute at the Golden Gate seeks to support park leaders in effectively stewarding the natural and cultural resources under their care, creating long-term methods for ensuring the sustainability of these important systems. With our increased dependence on technology and the growing distance between youth and our natural areas, parks must examine all of the tools at their disposal—both new and existing—to ensure that they are building authentic, valuable connections with the communities that they seek to serve. Looking at this challenge, we have begun to ask: Which tools can parks best utilize in order to create future generations of stewards from an increasingly urban population? Might internships be one such useful tool in achieving this aim? Our Emerging Leaders Urban Fellow, Ruth Pimentel, saw that both the Golden Gate National Parks and Indiana Dunes National Lakeshore had established internship programs that appeared to be successfully instilling a spirit of stewardship in many of their participants. Wanting to put these observations to the test, Ruth conducted research and collected data on the programs. She found that interns at these parks often go on to be engaged, informed, and active park users – showing that successful internship programs can cultivate future stewardship. Firmly supported by the Institute’s belief in the value of studying and promoting such programs, Ruth collected her findings into the Institute’s newest report. 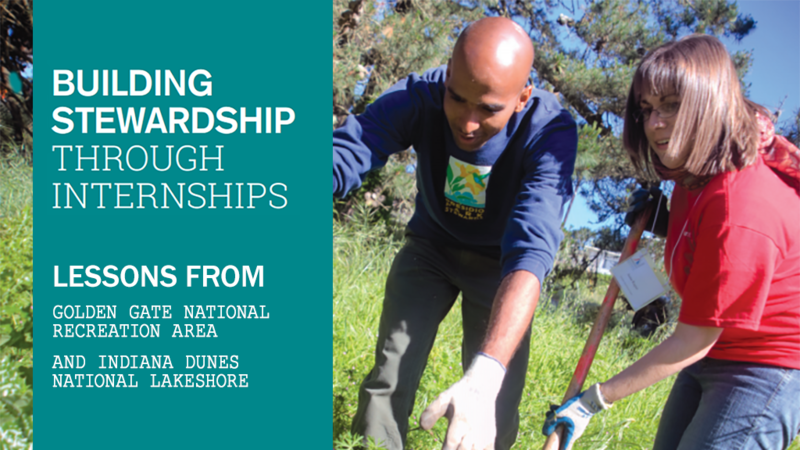 Building Stewardship through Internships uses these case studies to identify strategies for building a successful internship program and offers a roadmap for other park leaders seeking to strengthen their internships. We are excited to share these findings and encourage you to check out the report!